It’s beginning to become pepper season, when they start coming … they keep coming. Here is a simple canning recipe to preserve now for a tasty treat this winter. Enjoy! 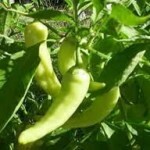 Wash whole banana peppers to remove any dirt. Remove tops from peppers and cut peppers into rings. I cut my rings sort of thick, but you can cut them as thick or thin as you want. In a large pot, combine 7 cups of water and 7 cups of white vinegar, heat on high until boiling. Add 1 clove of garlic to empty jar, and then pack banana pepper rings tightly into the jar. Add 1/2 tsp. salt and 1/2 tsp. alum to the peppers. Pour hot vinegar-water mixture over the peppers. Immediately put on lid and ring to seal. Repeat with remaining peppers and jars, water bath for five (5) minutes.